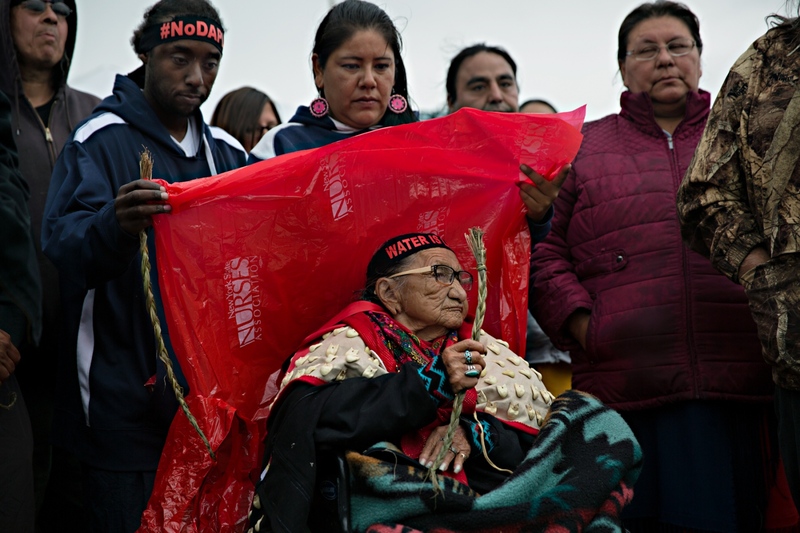 An 86 year old elder from the Sioux Tribe came to the gathering on her wheelchair after the Court denied the tribe's requested temporary restraining order against the Dakota Access Pipeline. While the Court ruled against the tribe’s motion to halt the pipeline progress, the Obama Administration declared that it would stop construction until further consultation with the tribe--and action that appears to have been motivated by the intensity of the protests and the popular support they had generated. 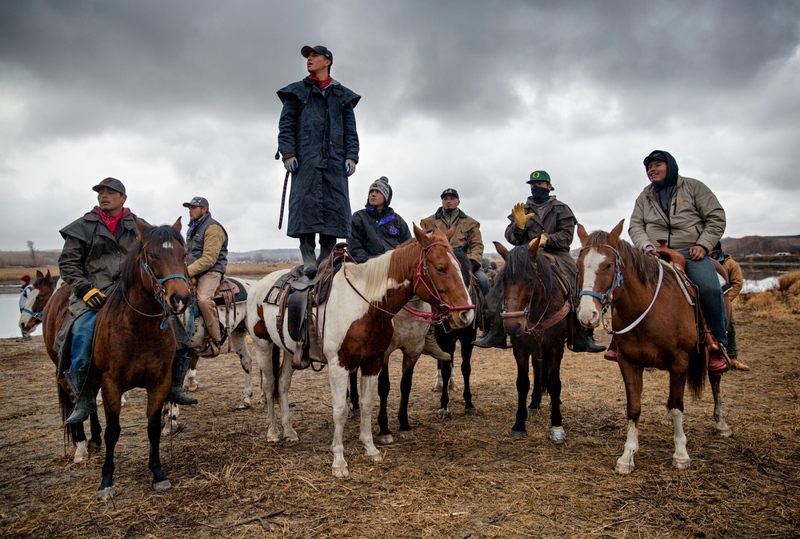 On the Thanksgiving Day morning A group of water protectors gather around while keeping a watchful eye on the police line over looking their activities from the nearby Turtle Island which is considered sacred ground. The night before, the law enforcement had destroyed a bridge to the Island which was in the process of being rebuilt during the first part of the morning. Chief Arvol Looking Horse responds to the request to come ashore by newcomers on their canoe and welcomes them to the Camp. It is considered good manners for the newcomers to the Camp to request permission to join the camp ground and offer a gift as a sign of their respect. The Chief then announces that the newcomers are welcome to join them and invites them ashore. Adoneus Bishop of Elgon Washington, has been in the Camp for 10 weeks and is member of the Oceti Sakowin Group. He says: "I am not going anywhere." 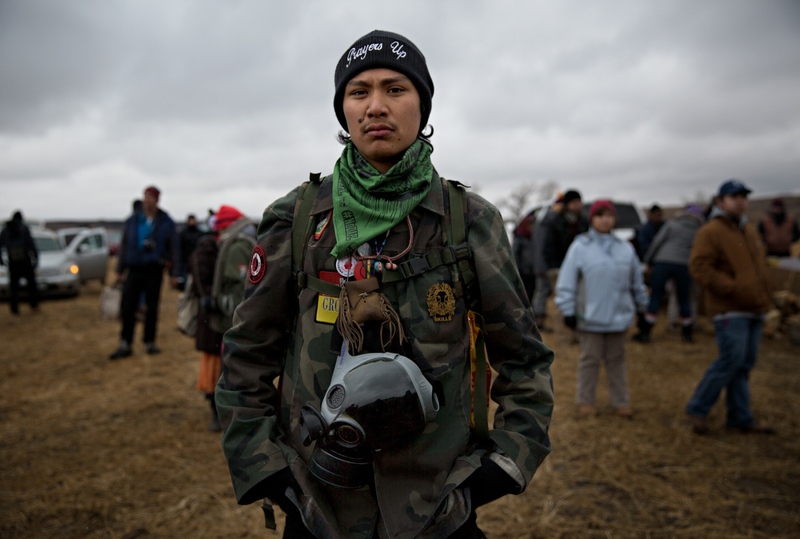 The Common Man's Society of the Oceti Sakowin Camp at Standing Rock, ND, is a group of men and women who Serve, Protect, And Tend to the well being of camp. The protectors, many of them, arrived to the Camp with their family including children of various age. Fun activities including basketball, volleyball, soccer and musical entertainment occurred on a regular basis. 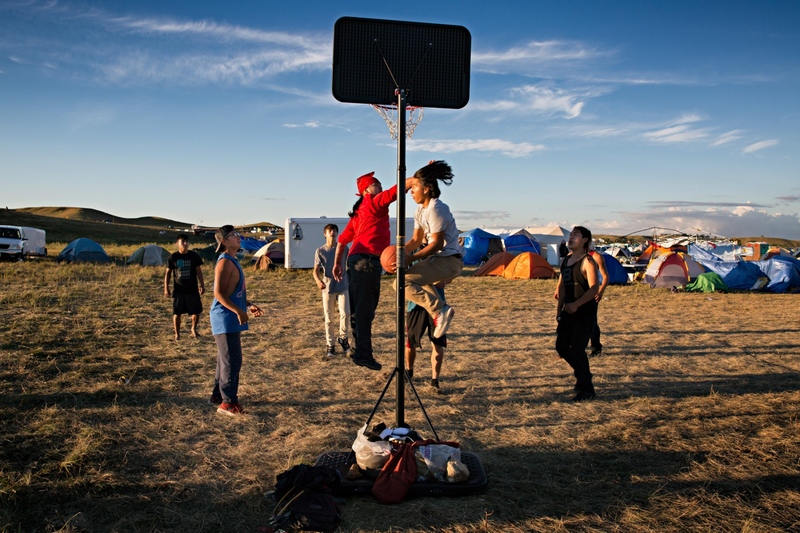 Here, some teenagers play a friendly but fierce game of basketball during the day. The Oceti Sakowin camp functioned entirely on donations and volunteer work by an army of volunteers. The tasks were distributed according to ability, experience and know-how. Volunteers operated the Mess Hall and provided the residents of the Camp with three hot meals a day. When in the early morning hours word came down that the local law enforcement had destroyed a connecting bridge to the Turtle Island, the entire Camp was in uproar. Quickly, the men, women and children assembled and began work to build a new bridge. By mid-day they were finished with the new bridge and began the process of installing it. Turtle Island, upon which the local law enforcement is standing is considered sacred ground by the Native Americans. The law enforcement on top of the Turtle Island, which is considered sacred ground, warn the protectors against crossing to the Island. 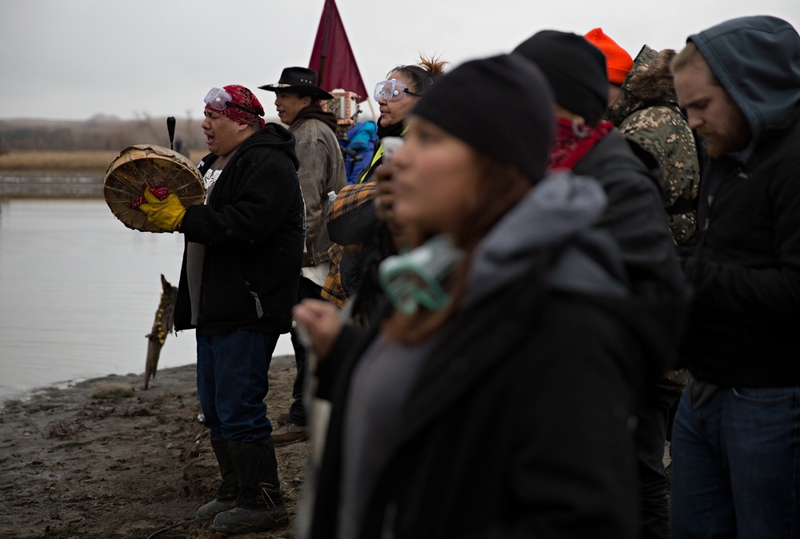 Ignoring the law enforcement orders to leave the area, the protectors crossed the river and engaged in ritual prayers on the Island. A view at dusk of the camp from the adjacent hill known the "Facebook Hill" which was one of the few areas where cell phone connection was at its strongest. 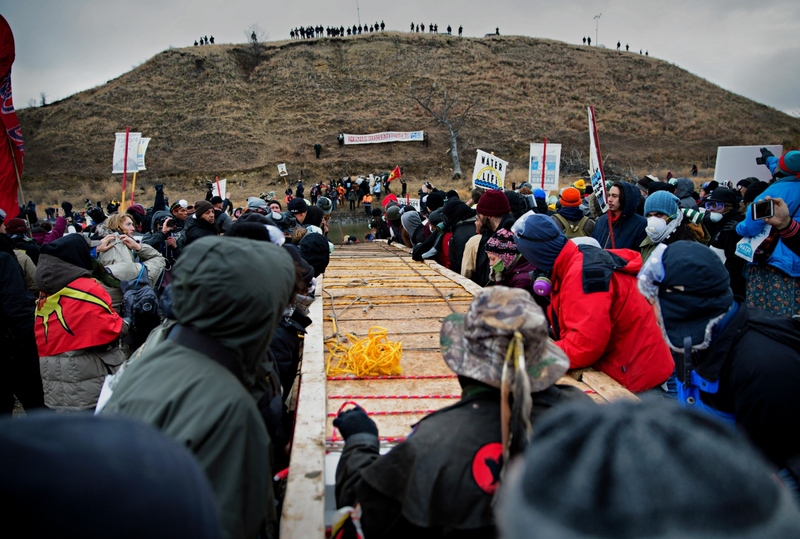 At times, it was estimated that some 7000 protectors, and supporters occupied the Oceti Sakowin Camp. The moonlight covers the Camp after the sun down on an almost clear night during a frigid November night. 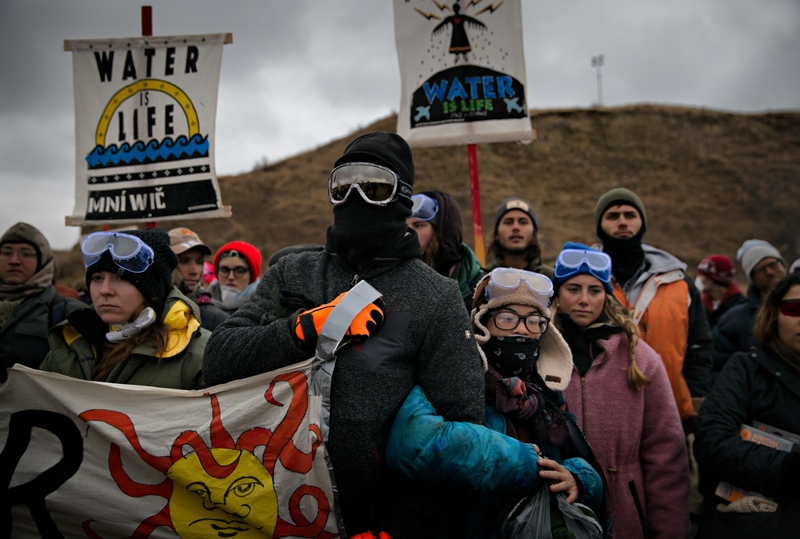 The Camp's atmosphere was happy after the Army Core of Engineers issued a decision to halt the Dakota Access Pipe Line and denied the easement sought by the oil company to drill under the Missouri River. The victory did not survive the election of Donald Trump as the 45th President of the United States. 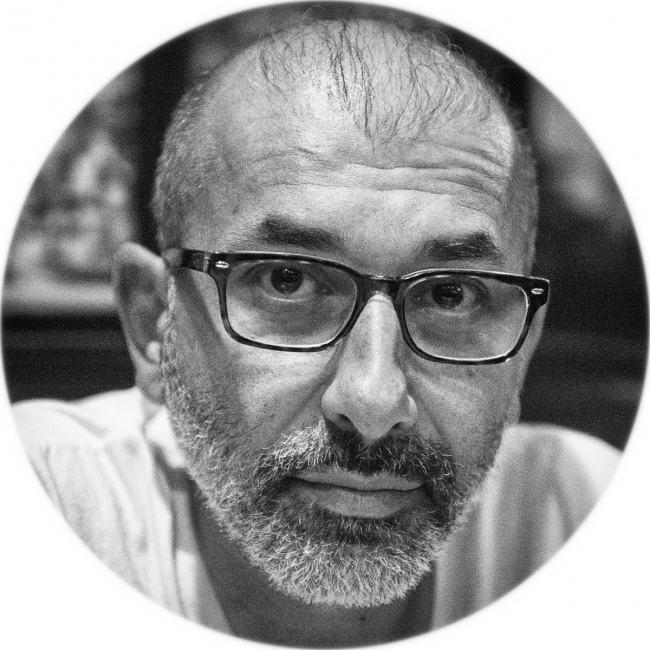 Chanse Adams Zavalla, of California, arrived four months ago and is prepared to stay until the end. Aside from the Mess Hall, individual camps also provided meals and food to anyone who happen to be around. 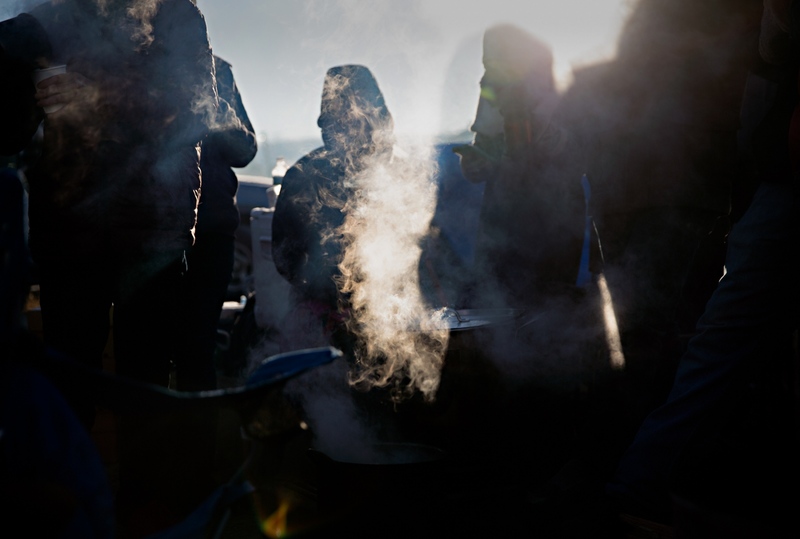 During the early morning hours on a frigid December morning, fresh hot coffee steams out of a pot boiling over fire in one of the individual camps. While a bridge that was destroyed by the local law enforcement was being rebuilt, water protectors chant in response to the law enforcement directives to leave the area. Aubrey Hart aka Hope, a newly arrived camp member, burns sage during the Thanksgiving day. Burning sage has a cleansing significance in many cultures in the world including for the Native Americans which hold it to be sacred. Sage is considered to have a purifying energy which brings the body into balance and cleanse it from the negative energy and spirits. Water protectors confront the law enforcement directive to leave the area and not cross the river to Turtle Island. 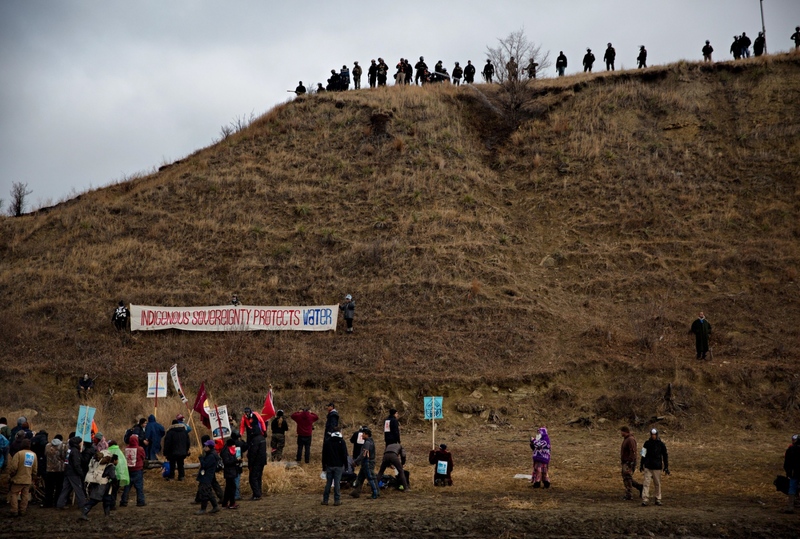 The law enforcement which was stationed atop of the hill on Turtile Island demanded protectors to leave. Turtle Island is considered sacred ground and the native americans simply wanted access to the Island so that they may engage in ritual prayers. 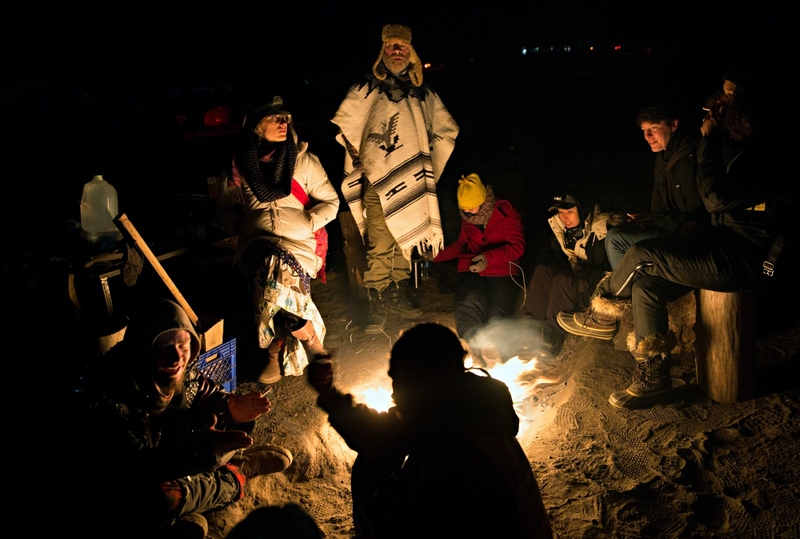 A group of volunteers gather around a camp fire singing and telling stories. At night, individual camps would be lit up by camp fires from the donated wood available for everyone's use. Many camps would welcome strangers to sit and enjoy the warmth of the camp fire and share in the meals they had prepared. 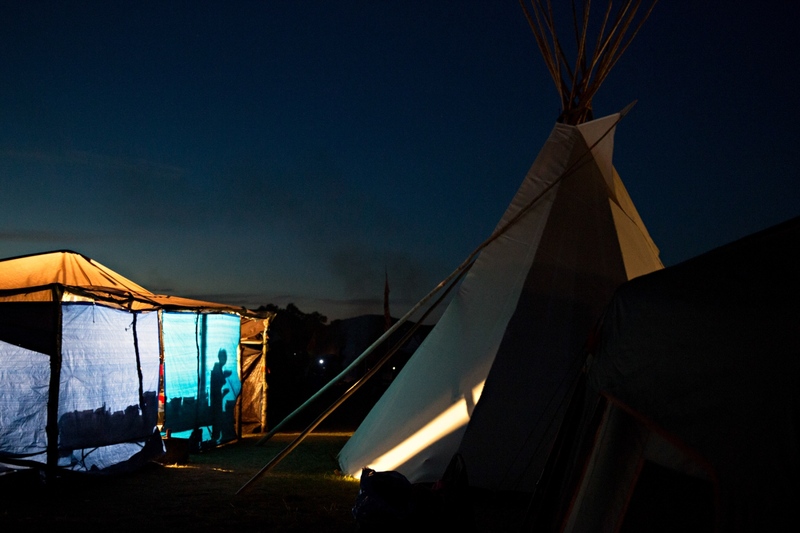 A silhouette of a camper appears inside a tent after the nightfall at the Oceti Sakowin Camp. The night sky revealed thousands of stars causing a mesmerizing spectacle which was specially intense to the eyes of city dwellers who were not used to see so many stars in the sky. 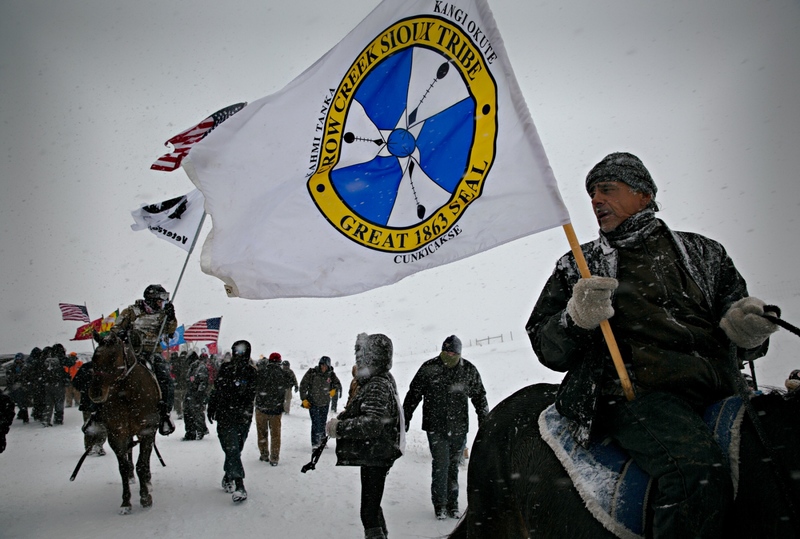 US Military Veterans for Peace joined the Water Protectors at the Oceti Sakowin Camp near the Standing Rock Sioux Reservation during a particulary fierce Decemer blizzard. 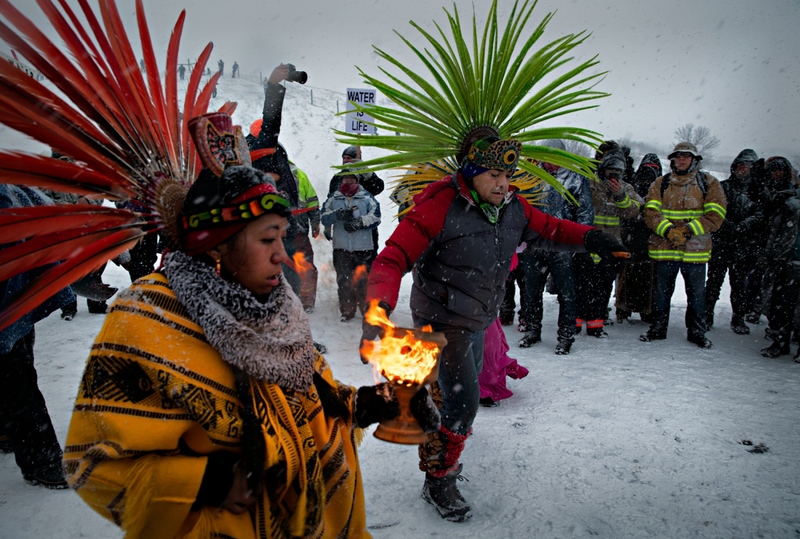 Aztec dancers accompanied the Veterans for Peace march during a December blizzard near the Oceti Sakowin camp. 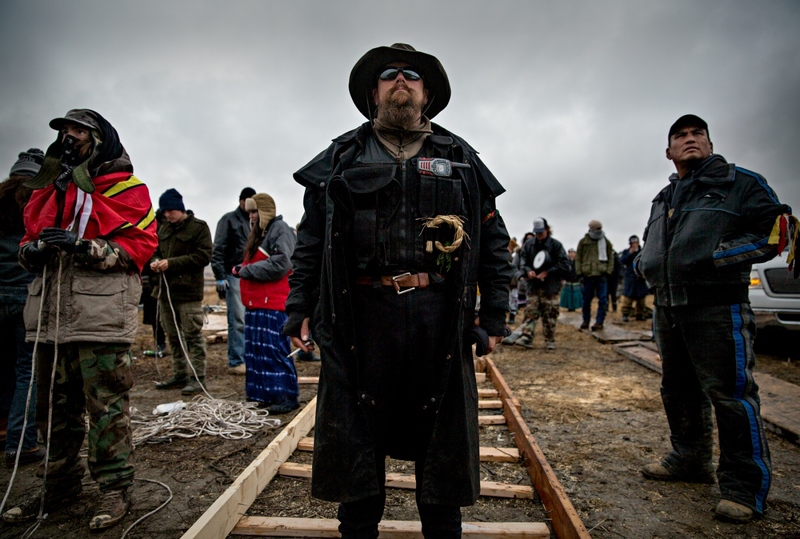 An estimated 2000 military veterans known as Veterans of Peace from around the US arrived at the Oceti Sakowin Camp to provide protection for the Water Protectors against the law enforcement whom they believe to have acted with excessive force against the Native Americans who oppose the Dakota Access Pipe Line. 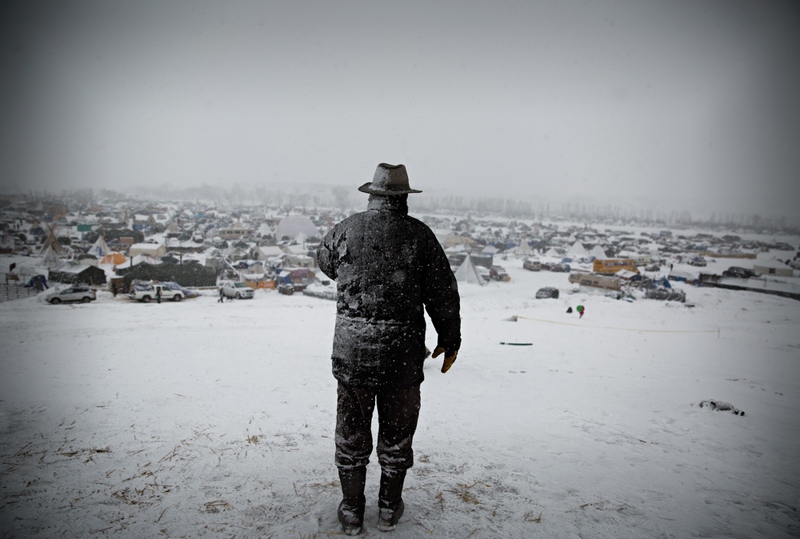 A man overlooks the Camp during a heavy snow blizzard on a December morning when US Military veterans joined the Protectors at the Oceti Sakowin Camp. 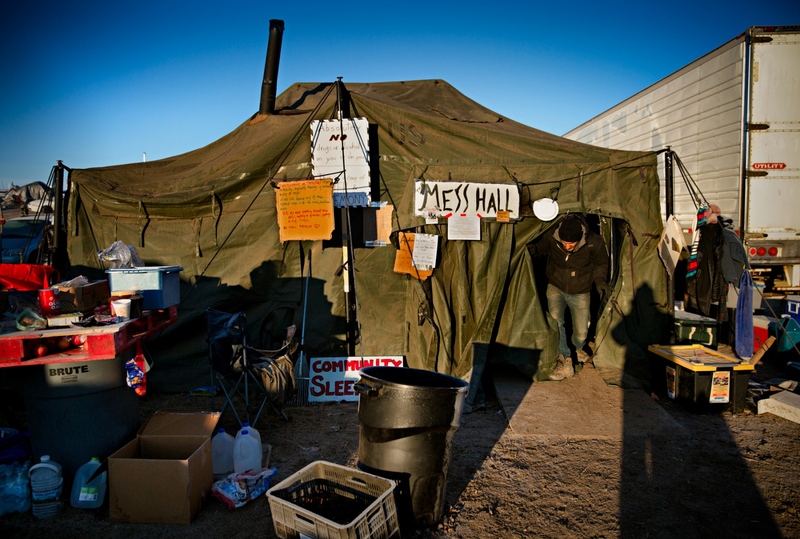 The veterans had vowed to provide a line of defense against the military style actions of the local and federal law enforcement that had surrounded the Camp. 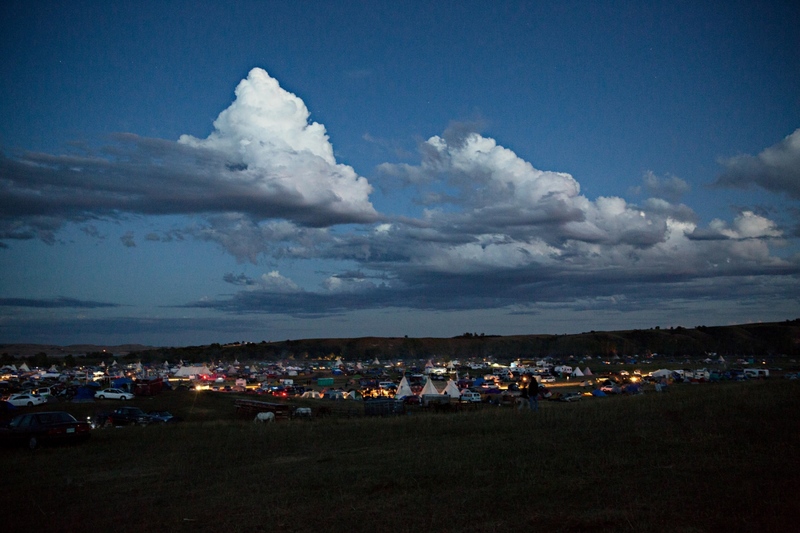 Spearheaded by the Standing Rock Sioux Nation, more than 125 Native American tribes and various supporters have gathered in a camp of peace and prayer or the Oceti Sakowin Camp, to prevent the further construction of the Dakota Access Pipe Line (DAPL), the destruction of their sacred burial grounds and sites, and to protect their river and underground water from inevitable seepage that will occur once the “Black Snake” is allowed to continue its destructive way across the Land. DAPL will transport millions of gallons of crude oil across 50 counties and 4 States (North Dakota, South Dakota, Iowa, and Illinois) in 1171 miles of pipe at a cost of $3.8 Billion. The Pipeline crossing the Missouri and Cannonball River cuts through land that is sacred to the Sioux of the Standing Rock Reservation. Once they put out a call for help, tribes from all over the United States responded, sometimes putting aside long standing rivalries, and came to show their support in a historic gathering. There has not been such a gathering of Tribes in close to 100 years. 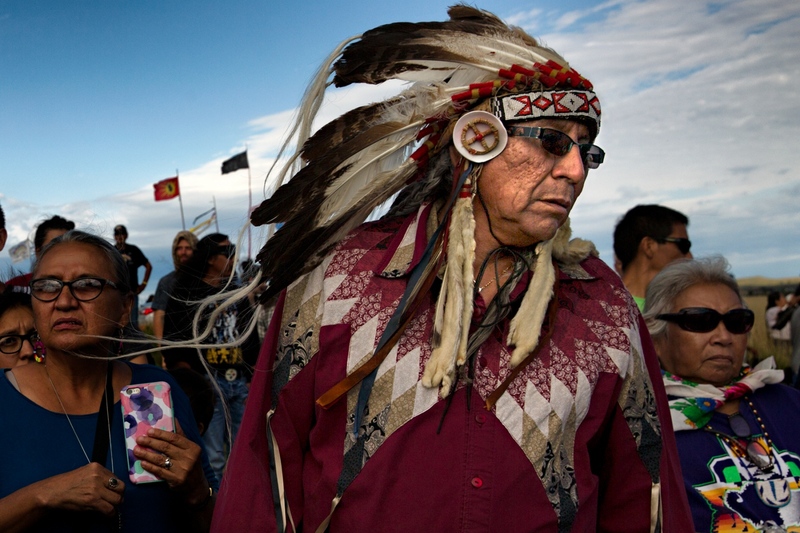 Aside from the threat to sacred land, the pipeline also threatens the environment. When (and not if - if history of pipelines is of any lesson) the pipeline breaks or leaks, the drinking water from the Missouri River would be immediately contaminated. The Army Corps of Engineers has denied the easement necessary for DAPL to dig and cross under the Missouri river. A victory the Native Tribes take with a grain of salt. With Donald Trump winning the Presidential Elections, the chance of having an ally in the White House is zero. If Mr. Trump's statements are any indication and the Protectors are now prepared for a long and hard battles to come. This is not over. 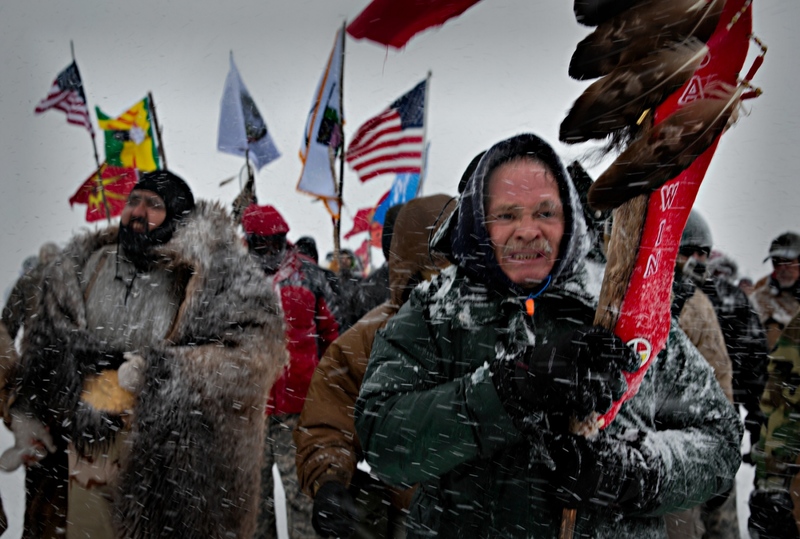 This stand off is one of the most important stories of the past several decades as it touches many sensitive subjects: the oil industry, the environment, climate change, Native American life and sovereignty, and federal laws and treaties. Update: Following the election of President Donald Trump, the new Administration overruled the denial and allowed the pipeline to proceed. In February 2017, the law enforcement in riot gear and automatic weapons entered the Oceti Sakowin Camp and forced all resident to leave and arrested a number of persons. 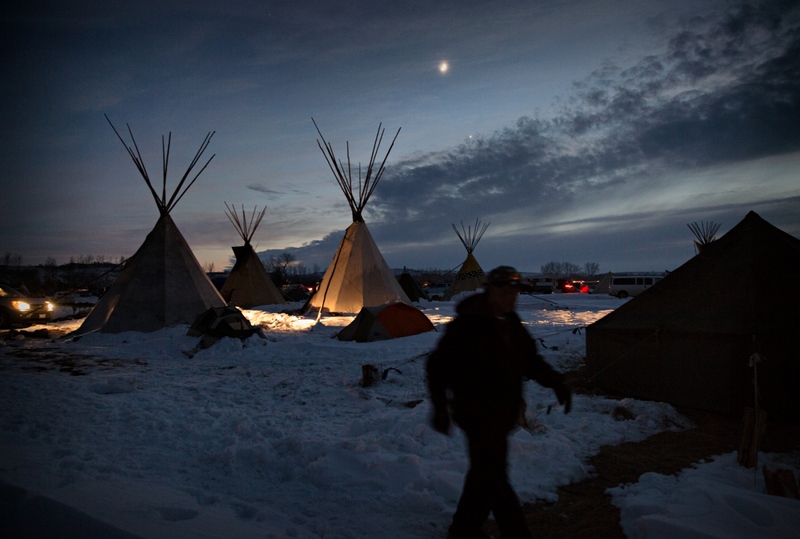 The Oceti Sakowin Camp was cleared and closed. As they exited, the tribes engaged in ritual burning of their tipples and tents and whatever they could not take with them.